Are you in need to buy a gaming mouse that has good DPI and high speed? When you visit a store or a website that sells gaming mice, have you noticed that some of the gaming mice have optical sensors while others have laser sensors. Have you ever tried to know what is the difference between laser and optical sensors that divide gaming mice into two different categories namely laser mouse and optical mouse? 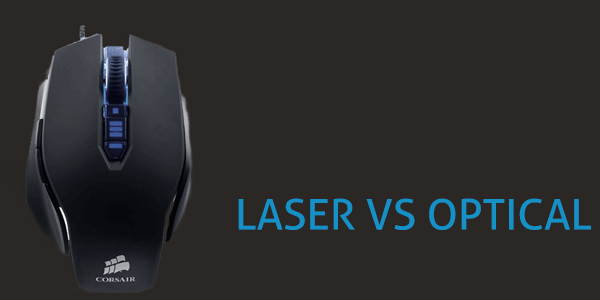 How do you decide if an optical mouse is the best gaming mouse or the laser mouse? If you have answers to these questions, then it is simply great but if you are looking for answers to these questions so that you can differentiate between a laser and an optical mouse then keep reading this post up to the end. For an average user or in terms of games, for starters, there is not much difference between the optical and laser mouse because the differences are not much except the technology. An optical mouse uses LED light to track movements. On the other hand, laser mouse uses Laser technique to track movements. The second difference between both is of the DPI. A gamer always wants higher DPI because higher DPI means more sensitivity. Laser mouse always has high DPI than an optical mouse, which means the laser mouse is more sensitive than the optical mouse. The difference in DPI thing was a question in the past because today, both optical and laser mice are hitting the mark of high DPI. Even optical mice come with DPI up to 8000 or even more. Laser mouse supports more surfaces than an optical mouse; however, for the best performance of laser mouse, it should be used on a hard mouse pad with a plain surface. Laser mice use the latest laser technology due to which users prefer them as the best gaming mice, but this is true only at a highly professional level. On an average grade, many differences cannot be noticed. However, the difference in pricing is really noticeable. Laser mice even work well on a glass surface and other similar surfaces, whereas optical mouse does not work smoothly on such surfaces.